Jeffery Nadel is the 20 year-old President of the National Youth Rights Association or NYRA, which played a key part in the Takoma accomplishment. 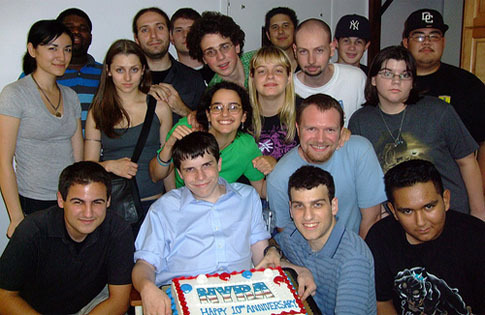 NYRA, a national non-profit, was founded in 1998 by YouthSpeak and Americans for a Society free from Age Restriction in order to professionalize the Youth Rights movement. It is youth-led and directed, and today boasts over 10,000 members nation wide. The organization is registered in Maryland, but has chapters coast to coast. The NYRA works against age discrimination of any type, and strives to lower the drinking and voting age through grassroots organizing and research. Along with a 20 year old President, the NYRA’s vice President is 15 and the Treasurer is a sophomore in college. Though protesting, raising awareness of Youth Rights and talking with government officials, the NYRA’s national presence has helped jumpstart the movement to lower voting ages around the country. Jeffery Nadel, NYRA President, was interested in Civil Rights at a young age. In 2008, he founded the NYRA chapter of Southeast Florida where he has worked to lower the state voting age to 16, meeting with legislators across the state. He and the NYRA also filed a lawsuit against a, in his words, unconstitutional curfew in West Palm Beach. In 2009, he was elected to the NYRA board and from there became the organization’s president. While the NYRA’s Executive Director and some administrative staff are adults, they report to the President and youth-based Board of Directors. The NYRA’s belief that the voting age should be lowered is argued from a perspective of both equal rights and practicality. Youth pay taxes, obey the laws, and can be subjected to adult criminal penalties. The NYRA argues youths’ contributions to society deserve politicians working on their behalf. Well, why can’t their parents just represent their interests? The organization responds, similar arguments were raised against women voting, many believing a woman’s husbands could represent their needs with less confusion. The NYRA believes a 16 year old’s vote offers a unique and necessary perspective, and is just as valid though different from a 56 year old’s vote. If 16 year olds aren’t voting, their wants and needs are being undermined legislatively. Their ideas can be pushed to the margins and their perspective is less valued. Practically, the NYRA goes on, if adolescents began voting at an age where most have a single, permanent residency (verses college years), voting is more likely to become a lifelong habit. Similar initiatives, spearheaded by teens, are in the works around North America, and in the United Kingdom, Australia and Europe. Teens from Lowell Massachusetts, upset by school budget cuts, recently spoke at the Massachusetts state assembly, calling for the state to lower the voting age to 17. In Ireland this June, the national convention recommend lowering the national voting age to 16, arguing the earlier one starts voting, the more likely it will become a lifelong habit. In Europe, Austria already has a national voting age of 16. Up until the 1970’s, the voting age was 21. The debate over a lower voting began in earnest in the aftermath of WWII and intensified during the Vietnam War. The irony that 18 year olds could be conscripted to fight overseas yet were not mature enough to cast a vote was not lost on many. Increasingly, the student movement against the Vietnam War pressured congress to act. A common theme at antiwar protests was, “If we’re old enough to fight, we’re old enough to vote.” In 1971 the 26th amendment, which lowered the voting age to 18, was quickly signed into law. The modern chapter of the youth rights movement began in 1998 when the first major nationwide protests were organized, calling for a younger voting age. The most successful was in Santa Monica California where 25 protestors, aged 13 to 17, demonstrated in front of a local book store, handing out pamphlets and explaining their cause. Over the next decade the movement gained momentum, earning media attention from big names like Slate Magazine. In 2008, NYRA aired the first ever commercial to lower the national voting age. In the 30 second video, which aired in Washington DC, youth calmly describe their position and ask viewers for support. While maybe not of Super Bowl quality, the video, the video’s message was easy to understand.